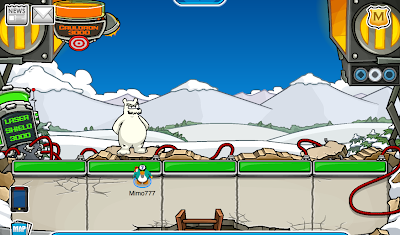 Club Penguin Cheats by Mimo777 Club Penguin Cheats by Mimo777: Club Penguin Herbert Attacks The EPF! That's so cool! I really need to go battle Herb now! 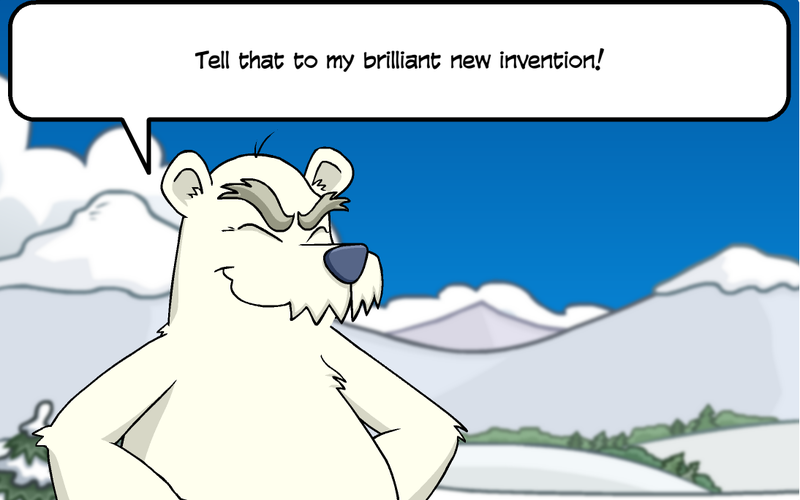 I think that Herbert and Fail Dail are working togethter! Whenever I try, Fail Dail pops out! 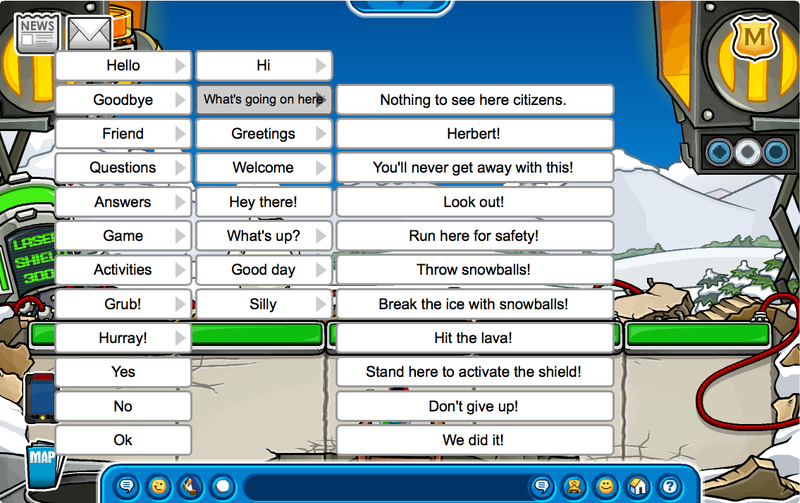 Im waiting beside Herbert right now! Hes still setting up his plan. The glitches have been fixed! They're the same dragons from the Medieval Party Ye' Knight's Quest 3! Defeat them the same way but to defeat yellow, stand on the green bars. 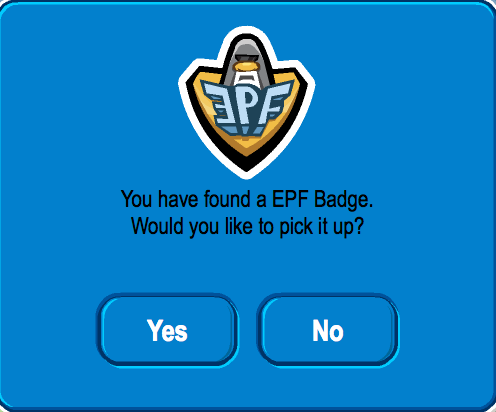 At the end, you get an EPF pin, a Dragon Furniture item, and 3 EPF Medals! i think this week wont come a field ops, becauz of thiz? dont ya think so 2? 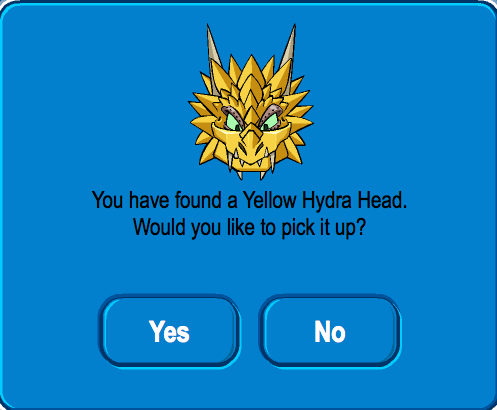 It is fixed now and at the end you get a epf pin and yellow hydra hat but the hydra hat has a glitch on it because you can add it to your items as many times as you want and when you add it its not even there!!! 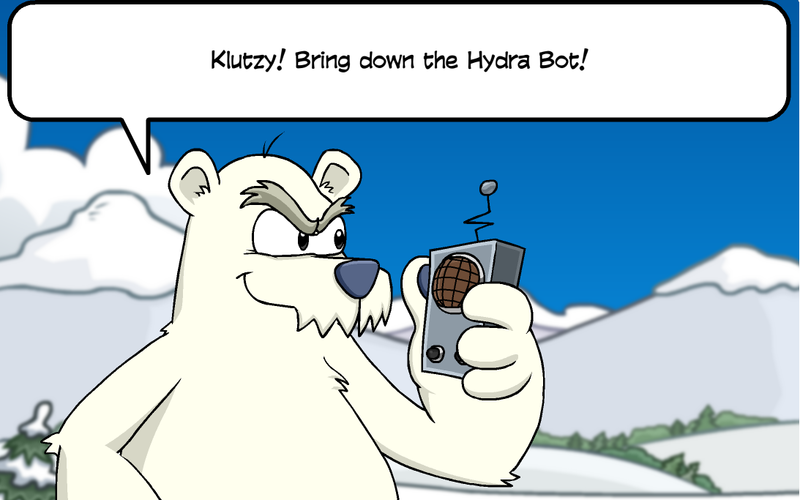 works now, you have to hit the cauldren onto the hydra in front and prevent them from repairing, you get three medals and an epf badge pin. 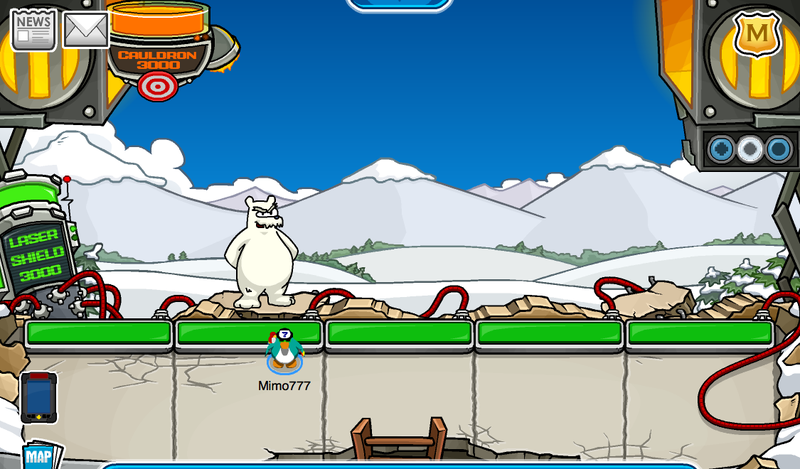 Works best if the quality is set on speed, seen in the upper right corner of the screen (the three circles), so you can shoot snowballs faster. 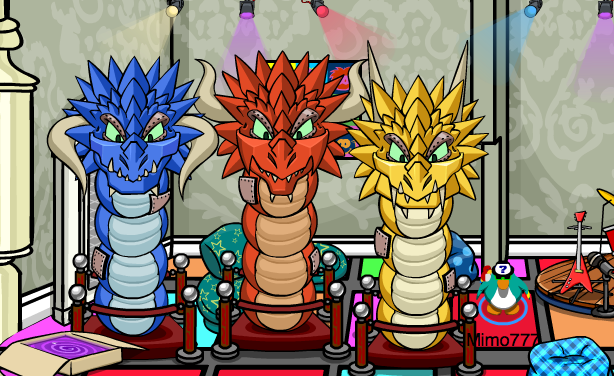 I think you have to beat the hydra heads twice. 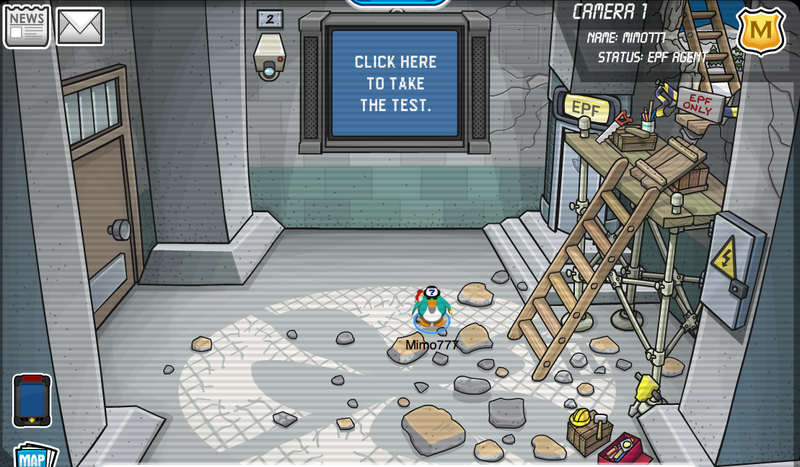 I beat Herbert and Klutzy and got an EPF badge (pin) and a Yellow Hydra Head (furniture)! 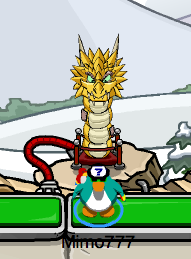 I battled him and i won! 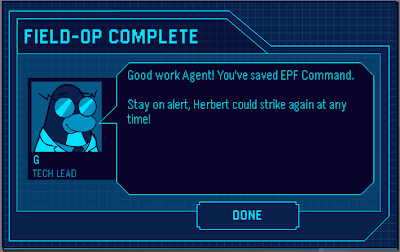 Mimo, when you beat herbert, you get 3 medals, a EPF pin, and Yello Dragon Furniture. It's cool! 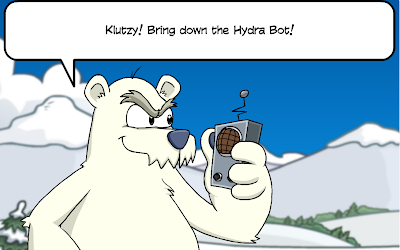 You get a hydra head when you beat him. When you beat him you get a Yellow Hydra Head and a badge along with 3medals. However the Hydra Head will not go to your inventory! 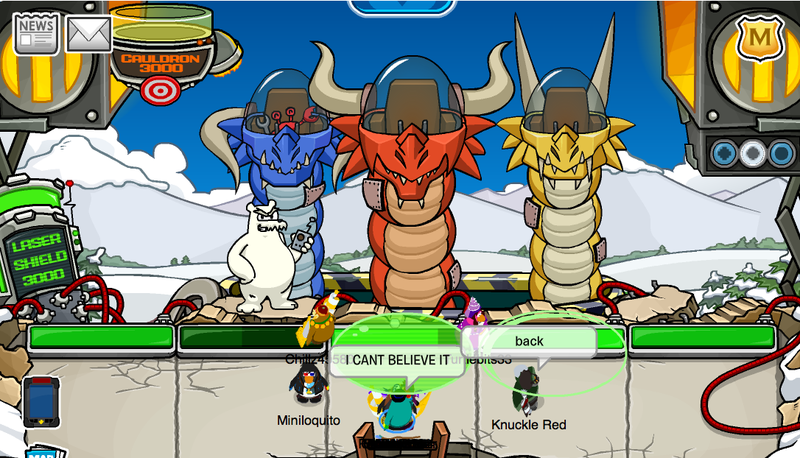 To beat the red Hydra you have to hit it with snowballs, and the shield can't block its attack. The blue Hydra you beat by hitting it with the lava, and the yellow Hydra you beat by reflecting its attack with the shields. 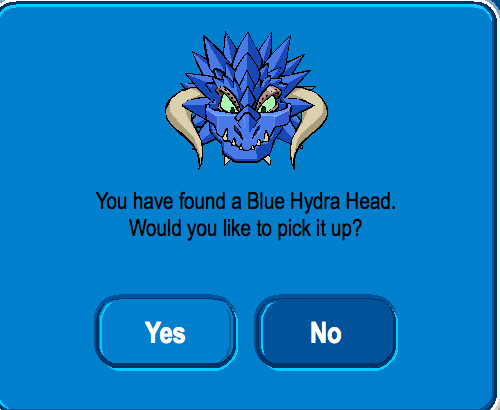 Beat the game more than once to win a different color Hydra head for your igloo! That's weird...The party is over yet i can still hear the party music. 5/31/11. Go there NOW BEFORE THEY TAKE IT AWAY! 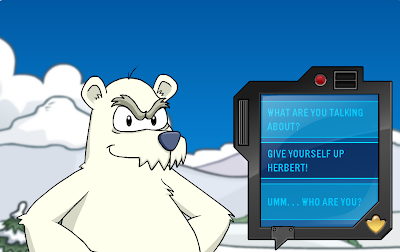 That was way too easy to beat Herbert. 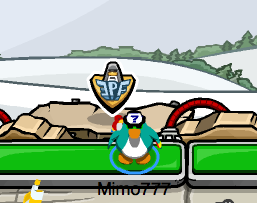 Help me Mimo!I can't talk to Herbert!It won't let me!Is it a glitch? Ps please post.I've never been posted! 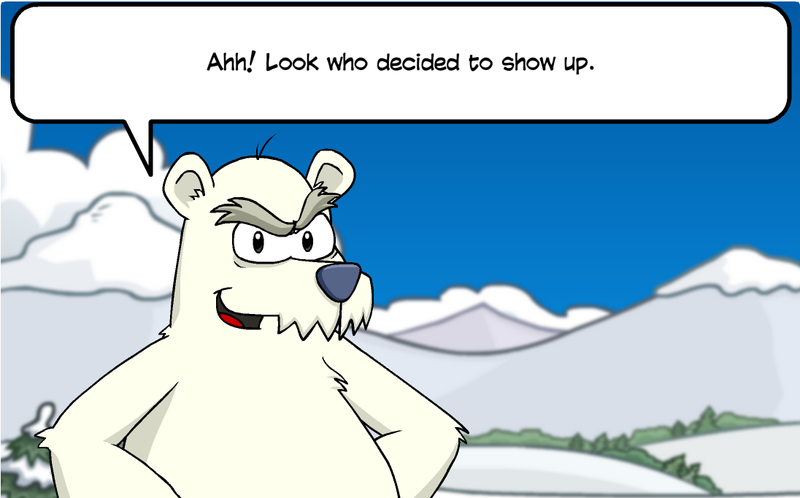 Club penguin isn't really good at coding...There is a MAJOR bug with this...It wont let me play it just has Herbert's weird face staring at me for an hour. 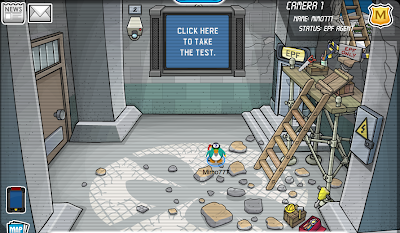 Mimo, I saw you wrote that you can change quality, and also that if the red smoke touches you, you go to the EPF. Well, the exact same things were in the Medieval party, too! You forgot to mention that! i hate it when club penguin goes wrong with everything!!!! Add me in cp everyone!!! i cant click on herbert! how do you defeat him? 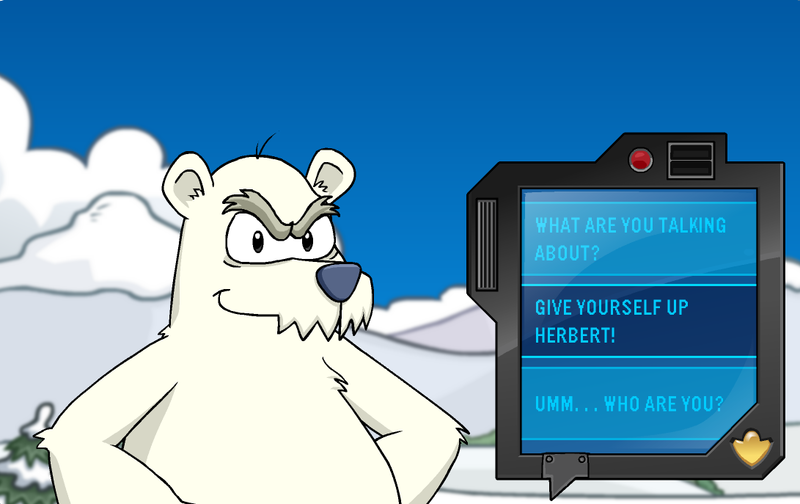 Herbert will turn around but that's it. It's me again and I just wanted you to nodice that there is a glitch with not being able to click on Herbert and thus not being able to defeat him. The lava in the cauldron defeats the blue. 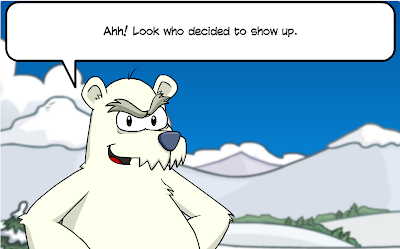 Snowballs defeat red. Snowballs break ice. Shields defeat yellow. Don't get hit by fire. 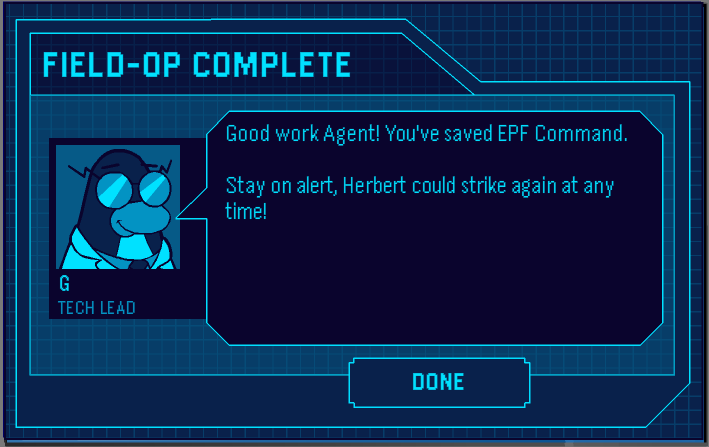 Sounds easy, but it's really hard to defeat him; I keep getting sent back to the EPF ground level. I hope we get some more days to do this! NOO!! 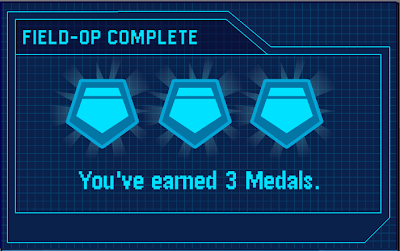 I completed yesterday nigth and just picked up the badge. I think I have to do it again.. I dont want Field Ops will be like this, takes too much time and it would be boring if always VS dragons. It's impossible.. We're getting all their bars down but they just keep getting repaired :[ Help?? i can't talck to him!!! 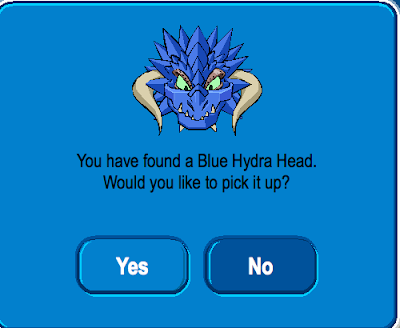 the colour of hydra head you get is the same as the final hydra you defeat. 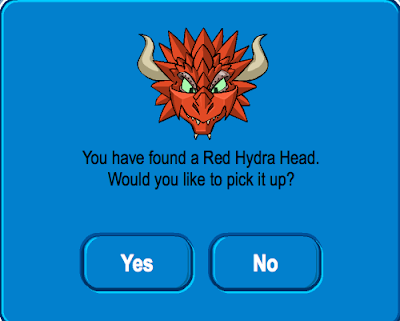 Can non members get Hydra Heads? 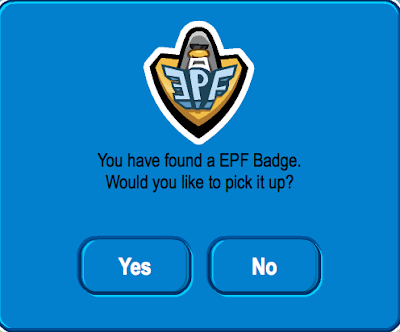 When I finished Herbert there were just Epf Badge Pin, no heads. I went on the French servers, and it worked there. Only problem was I got the red one and the blue one, and then it offered me the red one again not the yellow one! But they are cool anyway. help i cant get the red - blue - yellow heads!!! i defeted the 3 dragons 3 times now!!! HOW DO Y0U DEFEAT HIM?? i did to!! i dont get this! Going on a French server also worked for me. If you cannot get it to work, try going to another language. I beat it but I forgot to get it! I'm not a member and was sad not to get the heads but the pin is cool. My sister showed me how to fight them. 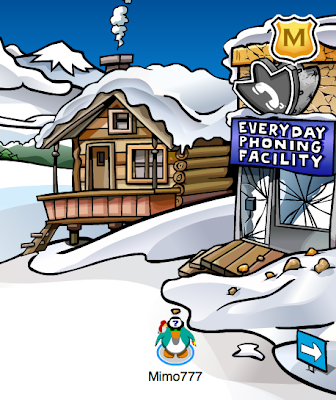 She made a cool igloo with games and posters and stuff . a sports bar Dad said, and the hydras are over at one end. This game doesn't start :-( But I don't know why? I cant click on him. how many plays to get blue? 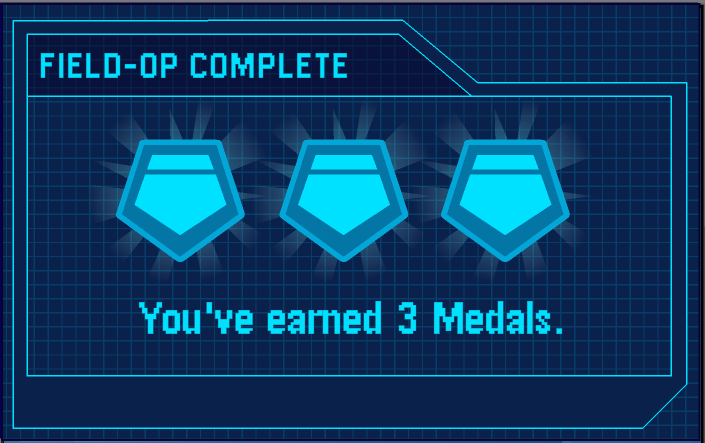 I beat the game about 5 times but I don't get the medals, though I got the EPF pin. Is this a glitch or something? Please help!!! 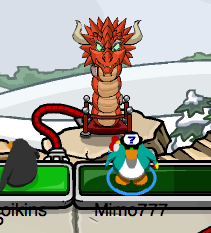 When I click him, He doesn't talk to me! Help! I can't get the yellow head! I tried it nearly 25 times but I can't beat them. It's so frustrating! Those fireballs drive me crazy. I've tried AT LEAST six times now..